I love to perform, life on the road is a grueling and rough thing for me. Madonna kicked off her first major live show, The Virgin Tour, at the Seattle Paramount Theatre in April 1985, delighting thousands of fans in the US and Canada. The tour climaxed with a sell-out performance at the Radio City Hall in New York, where Madonna made history selling 19.000 tickets in 35 minutes. Girls attended the concerts dressed up just like Madonna, wearing dozens of bracelets, crosses and laces, creating the “wannabe” phenomenon, while parents and the “moral majority” started questioning whether the show was too racy for teenagers. I get out there and work. My fans love it, and they come from a wide range, and all kinds of backgrounds. If they’re happy, I’m happy, so much for all the goofs who wanna decide if my show deserves an R or an X rating. One of the parts of the show that were considered too hot, was the spoken introduction to Everybody. Every girl has a box, but my box is special. Because mine makes music. But of course it has to be turned on. 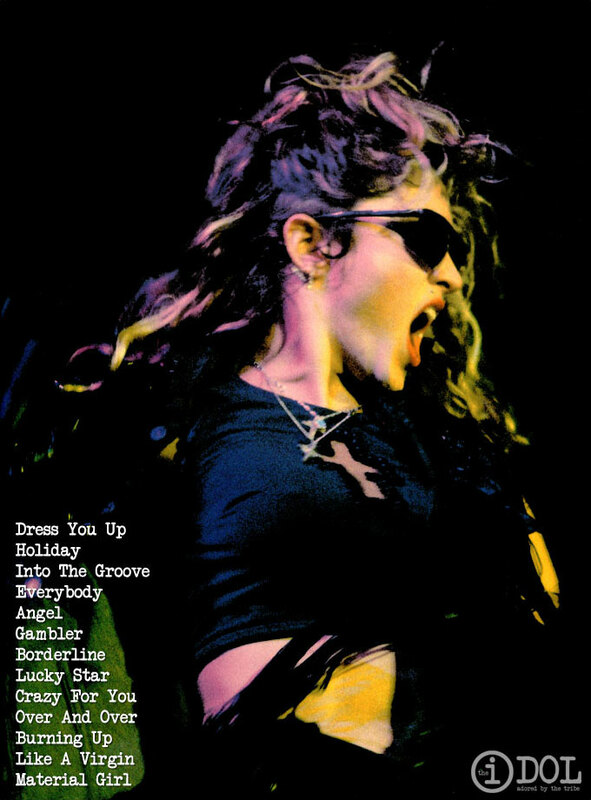 Some parts of the show were probably considered too hot for home video at the time, as the Everybody intro and songs such as Burning Up, with a sexually charged Madonna dancing all over the stage, are missing from the Warner official video of the Detroit gig of the tour. Another two numbers missing from the home video are Borderline and Angel. If you can’t make jokes about yourself, then you’re not going to be happy. You’ll be the saddest person that ever lived. In my concerts there are so many moments when I just stand there and laugh at myself. For the show’s ending, when “her father” comes on stage and drags her away, Madonna might have been inspired by an episode of her early life in Michigan. She once told a music magazine that she performed at the St Andrew’s local talent show arriving on stage, wearing a bikini and covered from head to toe with fluorescent green paint, looking pratically naked. Her father was mortified and fuming and wanted to drag her off stage. I was pratically naked, but the talent show was my one night a year to show them who I really was and what I could really be and I just wanted to do totally outrageous stuff. Father: Madonna, come down off that stage this instant! Madonna: Daddy is that you? Father: Come down this instant young lady! Madonna: But Daddy I’m having a good time! Father: You heard what I said! Madonna recorded a special spoken intro for the VHS release of The Virgin Tour. The lines were a sort of short summary of her struggling days, done in a funny voice. Giving a look back at this tour’s Memorabilia, the most desirable item by fans today is by far the Tour Programme. Being the Virgin Tour a Us/Canada tour only, it was hard at the time for fans from other parts of the planet to get this mini book with rare official photos from her first videos and beautiful images by Herb Ritts. Among the other merchandise that was snapped up by fans at gigs there was a range of Boy Toy items, from tank tops to belts and T-shirts. A selection of rosary beads and crucifix earrings was also available. The Virgin Tour also sees the first appearance of the “Madonna Money“. Madonna throws to the audience this specially created $100 bills from a nation called the “Altered States Of Madonna” during Material Girl, when she states that she needs love, not money, because money “it’s been nothing but trouble”. “Madonna Money” was later used during the 90’s as merchandise coupon at the official fan club’s Boy Toy catalogue.